Three inches of snowfall on Sunday capped what has been the worst winter in Boston’s history. 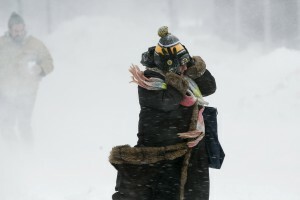 The city was dumped with more than 108.6 inches of powder this season, an inch more than the previous record, according to the National Weather Service. By all accounts, it has been a miserable winter. Blizzard after blizzard swirled through the city, shutting down schools and cooling the city’s economy. The relentless snow cost the state an estimated $1 billion in lost wages and profits, IHS Global Insight economic analysis firm told the Associated Press. The crippling conditions hit restaurant and retailers especially hard, with many storms coming on or before weekends. Boston’s Mayor even had to order residents to stop jumping from windows windows onto snowbanks that piled outside of their homes. Conditions quickly became dire. The Governor called in the National Guard to help shovel the city’s buried streets and sidewalks. With nowhere left to store the mountains of snow, the city declared a state of emergency and contemplated dumping it into the Boston Harbor. Forecasters warned that more snow could still be ahead. Boston residents, known for the competitive spirit, took the news of the record with pride.